The yearly MusicBrainz summit serves an important function in building our community: we talk about issues facing MusicBrainz and we plan the road map for MusicBrainz projects. The summits are usually scheduled to allow as many people to attend as possible and this year we chose Nürnberg, Germany as our location. MusicBrainz contributor Nikolai "Pronik" Prokoschenko lives in Nürnberg and was our local contract and ended up planning most of the summit. Pronik found us a conference room that we rented for the entire day, complete with open WiFi, which is important if you plan to have a room full of geeks. He also found us a cheap Gasthof that provided lodgings slightly better than a Hostel for a mere 20€ per person per night — a really good deal for Europe. The evening before the summit we all sat in the Gasthof and were treated to some confusing German/Greek cuisine with some of the most rude service any of us have ever encountered. But, our group is used to dealing with the crude Internet public, so we managed to laugh off the horrible service and still have a great time. To our luck there was a grocery store right next door to our Gasthof and we commenced another successful crowd sourced breakfast. Four people were each given 20€ with the instructions to buy food/drinks that they would like to eat/drink for breakfast/lunch. No collusion was allowed between people! Once the shopping was complete we walked to the conference room, settled in and dove into the masses of food we'd collected. Many tasty bread rolls with jam, nutella, cold cuts and cheese were consumed. 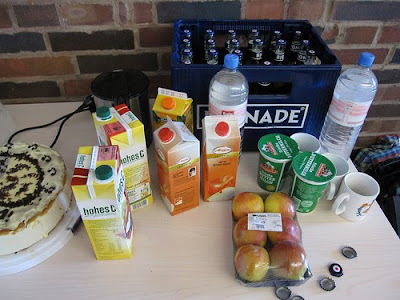 Of course we had fun things like a case of Bionade, juices, tea, gummy bears and chocolate. Crowd sourcing breakfast takes a potentially frustrating chore and makes it fun for everyone. 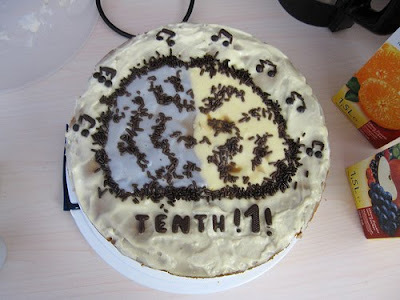 Plus, Pronik and his mate Kira brought a MusicBrainz decorated cake to celebrate 10 years of MusicBrainz! As people were eating, we started to collect an unconference-like agenda of what people wanted to talk about. We decided to have a detailed state of the project talk including recent developments from meeting our customers in Europe. We also talked about current development processes and some of the problems associated with these processes. Oliver Charles, a 2008 Google Summer of Code™ student, gave an introduction on how to hack on the MusicBrainz server, based on his work from the last year. Most of the time was spent discussing new features for once we release our much anticipated Next Generation Schema. At times we managed to get into deep philosophical discussions about what MusicBrainz is and what it should be. At other times we discussed light hearted topics with lots of joking. These summits do wonders for building our community and getting people on the same page. We manage to explore many topics and reach consensus on many points in one day instead of spending weeks on the same discussions online. Finally, in the evening we cleaned up our space and retired to a local beer hall where we continued the discussion in a less formal manner. If you're interested, we posted all the session notes from the summit on our wiki. All in all, this event was fun and not much effort to put on — thanks to Pronik! On another happy note, 1/3 of the people in attendance were women, which is much better than most tech summits I've attended. In total we spent about $1500, including all the food, drinks, lodgings and one person's travel costs. For a summit with 12 people, I think we did rather well! I call that Google's support well spent — thanks again for supporting MusicBrainz, Google!